Deltran Corporation founded in 1961. Deltran began as a tool and die shop, offering design and building of progressive tooling for their customers. Their commitment to excellence and quality was rewarded with excellent growth and by 1965, Deltran was able to purchase the necessary equipment to expand their capabilities to produce stampings. Today, Deltran maintains this high standard of excellence and is certified as an ISO 9002 registered business. We have become well known for producing custom precision metal stampings and offering tool design and building capabilities on site. 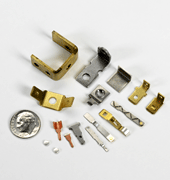 Some of the products we produce are precious metal contacts utilizing inlay, overlay and engineered metals, as well as quick connect terminals and various switch component stampings. We also have a proprietary tapping system which allows us to offer very competitive pricing for any tapped (threaded) stamping. Our stamping capability includes handling materials from a thickness of .006 to .093.
with a shunt height of 8”. Deltran provides additional capabilities which are obtained through long-term working relationships with other companies. These include procurement of heat treating, plating of the stamping, inserting screws into the tapped stamping, and insert molding solutions through Jaco Products. Deltran services customers from a wide variety of industries. Although these products are primarily focused on the electrical/electronic industries, we also provide products for the consumer appliance market, automotive, industrial controls and terminal block industries. We offer a variety of inventory stocking programs tailored to our customers needs. We maintain many programs at Deltran, such as Kan-Ban and Min-Max. We currently offer 3 day shipping on certain items by agreement with our customers. Deltran also ships to customers outside of the United States in Mexico, Costa Rica, China and other countries. Deltran welcomes the opportunity to quote your metal stamping requirements. You will find us most competitive for precious metal stampings and tapped stampings. 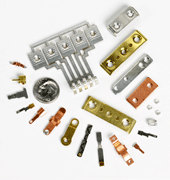 Our low overhead rates allow us to offer very competitive prices for quick connect terminals or other switch component stampings you may need. We appreciate your interest in Deltran, and look forward to adding you to our long list of satisfied customers.